Scarlett Reverie: Tonner Edward Cullen Portrait: Be-Dazzled! 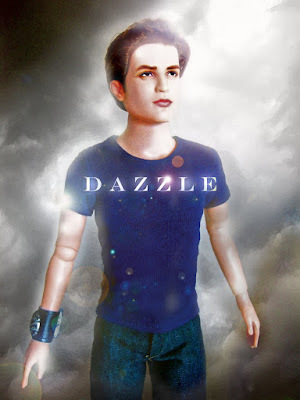 Tonner Edward Cullen Portrait: Be-Dazzled! "Dazzle" is a term used in the Twilight story by Stephanie Meyer to describe the unexplained attraction Edward Cullen creates for anyone. The portrait is Edward exposing himself to the sun -- in the story, vampires who expose themselves to the sun reveal their real skin -- iridiscent like sparkling diamonds. Tried to capture that here. My eyesight has gotten worse because of repainting. More photos to follow.